These pint glasses depict curious kitties getting all tangled up and loving every minute of it. Capture the frisky fun that happens when knitting material meets Mr. Whiskers with this Yarn Cat® Tumbler set. 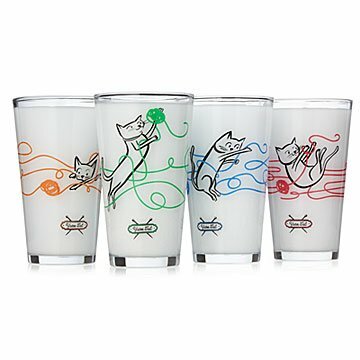 Designed by Patricia Carlin, the four pint glasses depict curious kitties in four different colors and poses. Sold as a set of four. Glassware made in the USA. Decorated in Chattanooga, Tennessee. Disclaimer: Cats and yarn don't make good playmates in real life. These are adorable but the stupidity of someone else who left a review really got me. THESE ARE NOT FROSTED GLASSES. They are quite obviously filled with milk in the first two photos. I just can't believe they actually thought they were frosted... haha. Other than that... buy these glasses they're great! I use these glasses every day and just love them--I bought one set and liked them so much I bought a second set. They are so whimsical. The tumblers are great for beer! These glasses are just too cute! I wish there were more designs! Very cute set that I decided to indulge myself. I love these glasses. I showed them to a knitting friend, and she loves them too! She told me I deserve to get myself these adorable glasses. I love them. Beautiful. Hopefully they will be dishwasher safe (that's the claim) and will hold up well. They are your typical pint glass but with a super fun design. Fingers crossed they hold up well. I've loved the previous "Naughty Cat" tumblers. Sad I couldn't get the older versions, but quite satisfied with the "Yarn" ones. The glasses are ADORABLE!! I love them!! Thank you!! I have two black cats and I love knitting, so these glasses were a perfect gift. They're well made and the designs are even cuter in person.